emerging contemporary artist in 2010 after stints as an artist, art writer and curator. Asya Geisberg Gallery is pleased to present Lauren Clay, “Windows and Walls”, a solo exhibition of sculpture, mounted on a wallpaper installation that covers the gallery walls. 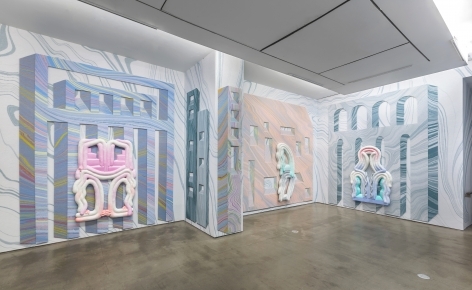 Previously featured in “Monochromatic” at AGG, Clay’s work has become increasingly complex, and in “Windows and Walls” the marbleized wallpaper and biomorphic sculpture intertwine visually and conceptually. Originating as white, tubular, and textured twists on the angular rigidity and slickness of Minimalism, Clay’s sculptures adopt pronounced references to space, architecture, and the body, and add high color and detailed curlicues. In tandem, her wallpaper acquires a double layer of illusionistic yet improbable spaces floating on a background of seemingly never-ending undulating stripes of color. The artist’s process translates a small collage of hand-marbled paper into an immersive floor-to-ceiling environment. Using traditional marbling techniques that evoke antique books, Clay’s psychedelic patterns leap from elegant old-world decoration to contemporary, digitally scanned, and aggressively scaled work.